’Magic Cut’’ in a blister pack. The instruction of producing manual is in 6 languages (English, Spanish, Greek, Italian, Portuguese, Slovak ) .The machine is ready to hang on the store shelf, does not contain any of our business data so you can sell it universally, and set the price. The machine has a bar code EAN-13, we join the promotional posters and leaflets. MAGIC CUT is your best choice when it comes to herb/leaf cutting machines for home use. The only part that needs replacement due to wear and tear are the cutting blades mounted under the rolls. If the machine is used properly, you can easily cut over 50 kilograms using 1 set of steel cutting blades. Why choose MAGIC CUT ? 1. Simple to use stationary machine for home users. 2. MAGIC CUT is made of metal. The cutting blades are made of stainless steel. The machine was designed with operational stability and durability in mind. 3. 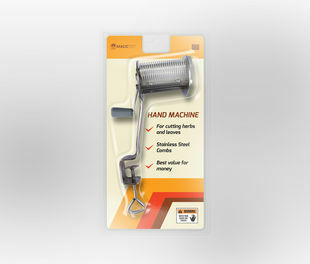 MAGIC CUT is your best choice when it comes to hand herb/leaf cutting machines available in the market. Rest assured that you are getting the best quality/price ratio.